screw machine products, CNC machining - Perry Screw Machine Inc.
We are a single-source machining job shop specializing in high volume production, from 1,000 to 10 million parts annually. 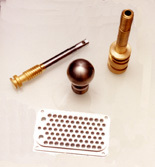 We work with most metals in a variety of shapes, and provide turning, drilling, boring, forming, threading, knurling, milling, reaming, tapping, slotting, and recessing. Our approach to business is to truly partner with our customers, providing such services as engineering and design, stocking parts for JIT delivery, bar code tracking, and blanket contracts. Our web site details our services and provides a virtual tour of our facility. We welcome your visit and inquiry.